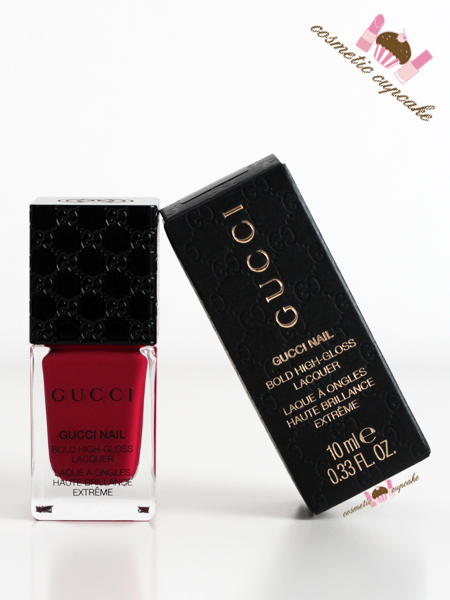 The lacquers are housed in a square bottle featuring a black lid that's entirely embossed with the Gucci double G logo and with the logo in gold on the top of the cap with an embossed box as well. 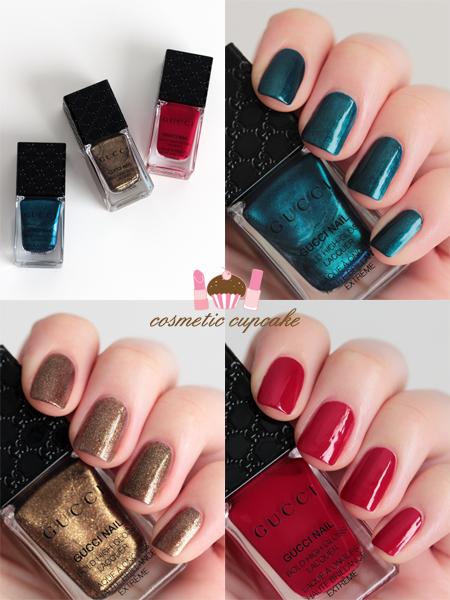 As far as luxury lacquers go the Gucci lacquers look the part and are made in France to boot. Iconic Ottanio is a beautiful vibrant peacock blue teal metallic with very subtle silver shimmer through it. Absolutely gorgeous and the stand out of the shades I purchased. It's wonderfully opaque and applied like a dream drying to a high gloss shine. 2 coats is pictured. Iconic Gold isn't your typical gold polish and is a glass fleck glitter in a copper brown base. Not much gold at all really! It's an interesting shade and the result on the nail is different to what you expect from the bottle. It almost looks like small flakies on the nail but dries quickly to a smooth finish. 2 coats is pictured. Iconic Red is classic dark red creme. Nothing ground breaking I know because there's a million and one like it out there but I do like to try red cremes from luxury brands as a baseline for their collection. The formula of Iconic Red is a tiny bit on the thick side but easy enough to work with and mostly self levelling. I have to say that I prefer the formulas of Chanel Dragon and Rouge Louboutin as they are simply flawless. 2 coats is pictured. Overall: I'm impressed with the shades I chose from the Gucci Beauty high-gloss lacquer collection and I'm hoping that they expand their colour range in the future. The specialised triangular-bristle brush delivers as promised for an easy application for a high gloss shine. Luxe packaging gets me every time and the chic black and gold double G packaging is a splurge I had to make for my collection. Bonus pic below of of the stand at Sogo, Causeway Bay Hong Kong. I was very impressed at the range of shades available especially for their liquid foundation and lipsticks. The sales assistant was absolutely lovely and super helpful too making my shopping experience very enjoyable - she was attentive but not breathe-down-your-neck attentive at all like I find a lot of sales assistants are in HK. Details: Gucci Beauty is available from selected Gucci boutiques and online from the Gucci eshop, Saks, Neiman Marcus and the bold high-gloss nail lacquers retail for $29US. I purchased these from the Gucci beauty counter in Sogo, Causeway Bay Hong Kong for $220HK. 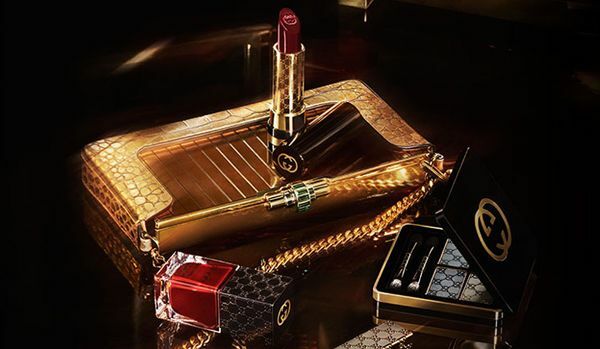 A full list of stockists can be found on the Gucci Beauty site. 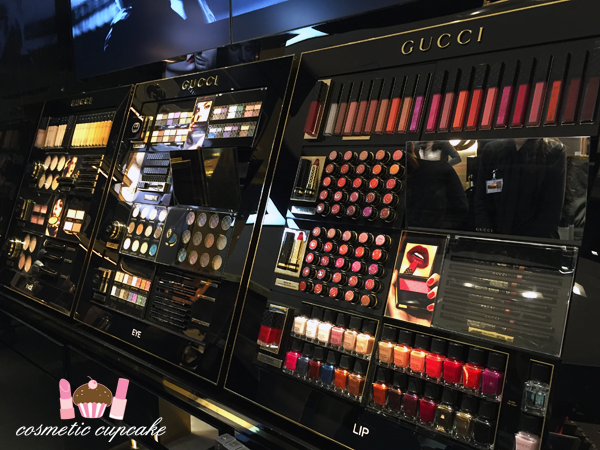 Will you be trying Gucci Beauty products? I'm hoping to try out the shadows and lipsticks next time I'm in HK ;) Thanks for looking! 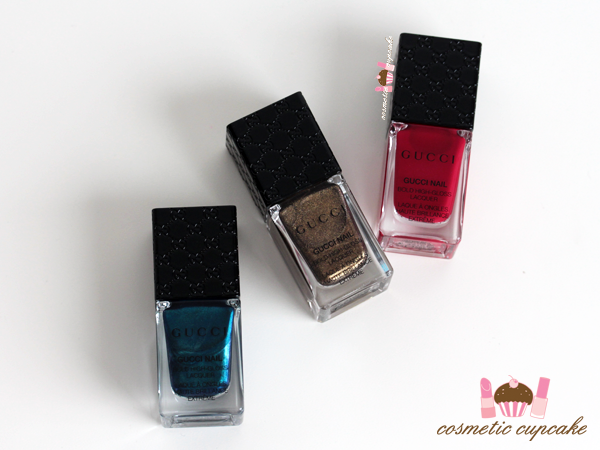 Haven't tried any Gucci cosmetics yet, but these three polishes Make want to do it soon! These are sooo beautiful! The packaging alone is worth every cent!